This summer I attended Anime Midwest with my younger child, Grey, who was on an in-character fan panel for Homestuck, a webcomic drawn in MS Paint that follows the adventures of John Egbert and his friends as they navigate a post-apocalyptic world through the multiverse. (I haven’t finished reading the comic yet, so forgive my glancing summary. You can, of course find more thorough information on Wikipedia and on the comic’s fan wiki. Or read the comic! It’s great!) 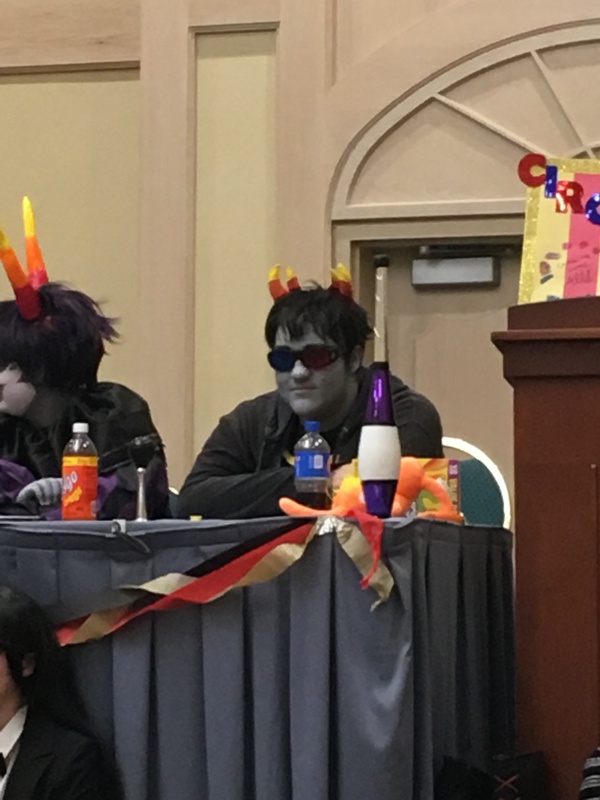 Grey cosplayed Sollux Captor, a troll, on a panel called “CircusStuck,” which is a reference to an extensive fan AU where all the characters in the webcomic are circus performers. Having not read in the Homestuck fandom, that’s about all I know to tell you about it, but it’s probably enough to be going on with for what I want to think about here, which is the places where anime conventions and academic conferences converge and depart from one another. The loosely-structured panel started with a round of truth-or-dare, continued through quiz-like questions (What Hogwarts house are you? 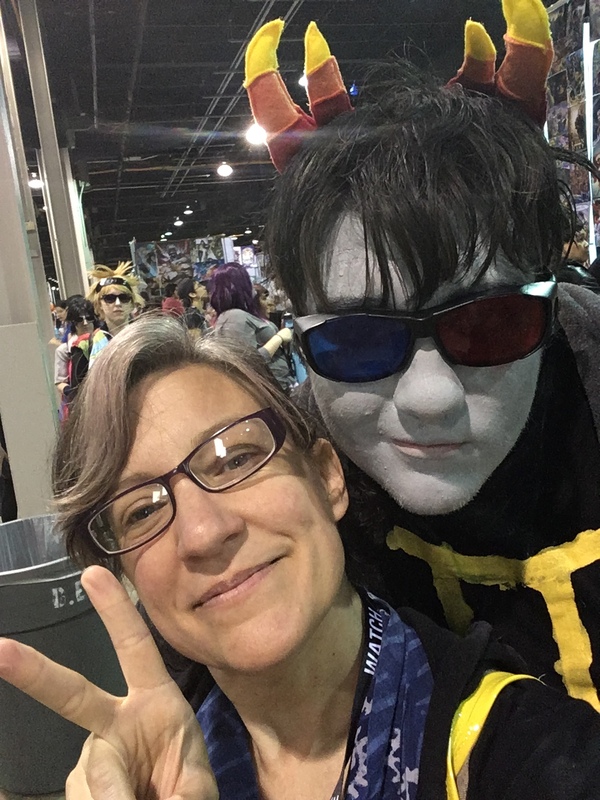 )—which were answered both “in-character” and “as yourself,” often to comic, conflicting effect—and caroused through improvised character interactions and sing-alongs to Homestuck fandom versions of popular songs. There were several moments when an improvised bit or a sing-along could have carried the panel, but the panelists didn’t often seize these opportunities. During Q&A (although, the whole hour could have been considered variations of Q&A) an audience member asked what the organizers would do differently when they planned their next panel. 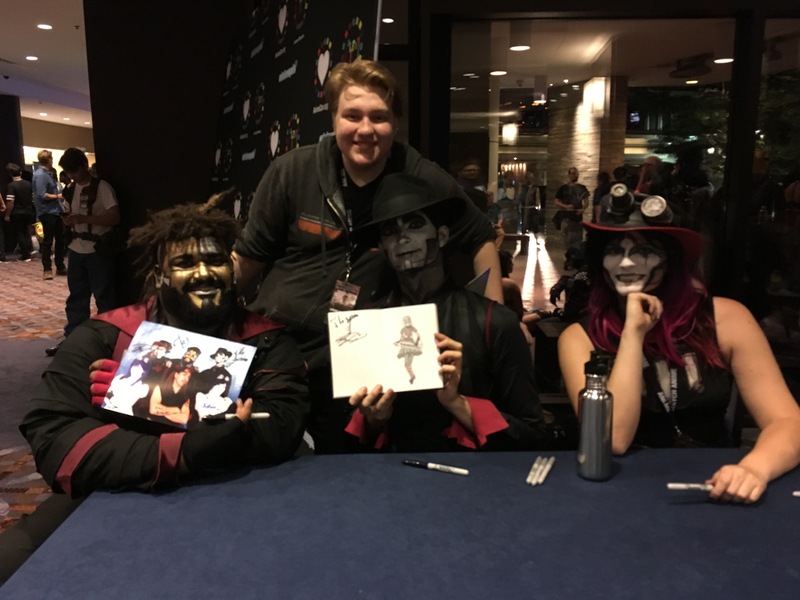 This turned out to be a touchy subject as some people who had planned to be at the con were unable to come, and while remarking on their absence was an easy explanation for the improvised nature of the panel, some panel members objected to “throwing shade” at people who were not in the room. (They had also wanted to bring a trampoline—an idea that was either nixed by the convention runners or concerned parents.) As a parent (and a sympathetic presenter), I didn’t want the panel to end on a down note. I raised my hand to ask what they felt had worked, what they would be sure to repeat next time. They had, after all, a good-size and highly participatory audience, great costumes, and some strong community moments. Really, they only needed a few more structured activities and planned transitions between them—a bit more advance coordinating, scripting, and rehearsal would have done the trick. And yet. There was something lovely about the patient and impromptu nature of the whole thing. Framed as an instance of epideictic rhetoric, it accomplished its goal: it surfaced the shared values and knowledge(s) that bound the community together and reinforced those bonds. If there is a takeaway for academic conference presenters (and I don’t suppose there *has* to be, but, you know…) I think it would be to think about the role of character and narrative and play in our academic work, to loosen some of our insistence on argument and control of the (panel presentation) structure. There are plenty of experienced, talented, and amazing rhet/comp and computers & writing scholars working in this vein, but I think it’s a message worth thinking about as a junior scholar. Given my interests, commitments, and growing knowledge of the field, where can I give myself permission to play, and how can I explicitly invite my audience into that environment? And maybe—as a longer project—how could I fashion at least some part of my academic work to be as accessible to my 17-year-old as the anime convention was to me? I attended MetroCon with my youngest grandson, age 11, and was humbled by the knowledge he has of a genre I know little about. Like you, I couldn’t help comparing the event to the academic conferences I attend. Although, at the 2016 Literacy Research Association conference, the organizers brought in a graphic novelist/artist who wanted his work to reach people who don’t traditionally read comics. So he turned one of his books into a 3-D gallery-sized read-it display with live actors portraying some of the characters and life-sized props that he used as he was creating the art work. What he brought to the conference was just a small part of the display with props but no actors Then a panel of academics discussed it in theoretical and critical terms — quite interesting!